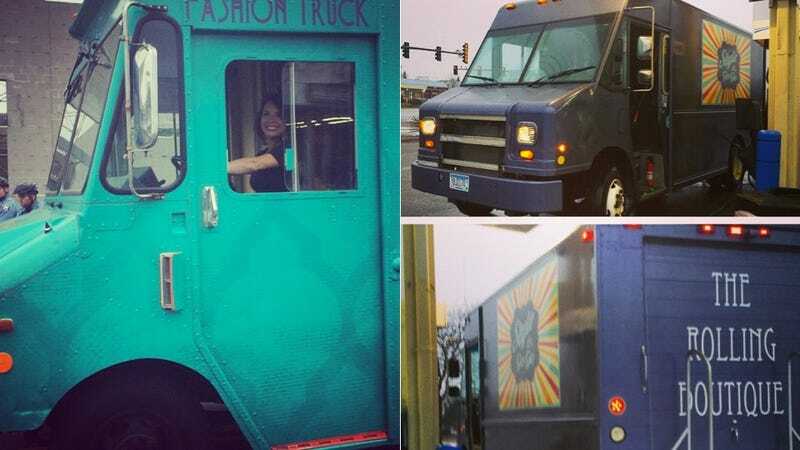 Sure, you’ve heard of the food truck—mobile kitchens that drive around town bringing you hot dogs or barbecue or whatever else you’re hungry and engorged heart desires—but have you heard of the fashion truck? Great, but will they still bring me tacos? That’s a no on tacos? What about bành mí? Got any of that? Hm. Do the husbands get bành mí? Does anyone get bành mí? No, it seems they only get clothes. This coming Saturday, Minneapolis will host the Fashion Truck Festival, an event organized by Style A Go-Go truck owner Kim Huston. I’d go if I lived in the Twin Cities even though the idea of trying on clothes in a sweaty, cramped truck sounds very terrible to me. Mostly because I assume that there will be food trucks nearby. Images via the Instagram accounts of Flaunt Accessories and Style A Go-Go.